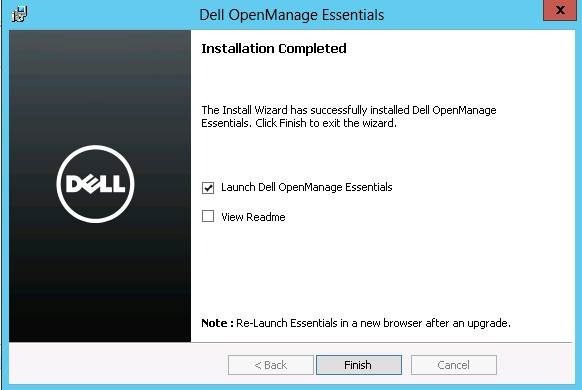 In a previous HOWTO (HOWTO: Installing Dell Open Manage Essentials (OME) v1.2 on Windows 2012) I covered the installation of Dell OME v1.2. 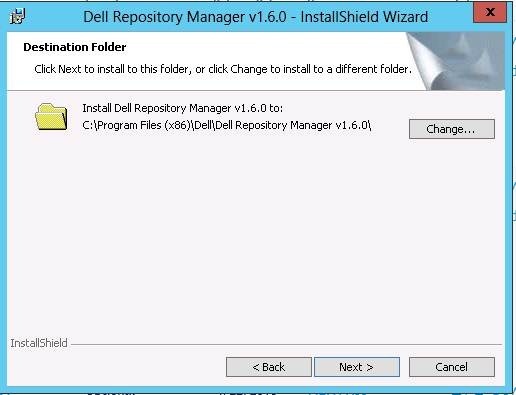 This installs other additional components – one of which is Dell Repository Manager v1.6.0, used for downloading and managing required updates (eg: Drivers, Firmware, BIOS, Management (eg: OMSA) tools, etc) for known and managed systems. This document covers the simple installation of that product. Accept the licence and click NEXT. Enter your customer information and click NEXT. Accept the default Destination Folder, and click NEXT. 2) The startup splash screen will load. You will likely be prompted for credentials, and should use your Domain Admin account. 3) The initial screen will show new logs and alerts, which are largely because we’ve installed the program for the first time. Click the X in the upper right corner. As you can see, there isn’t much here. We’re going to keep all these default settings. You MAY want to change the CONSOLE SESSION TIMEOUT to suit your preferences. 6) Click on the EMAIL SETTINGS sub tab. 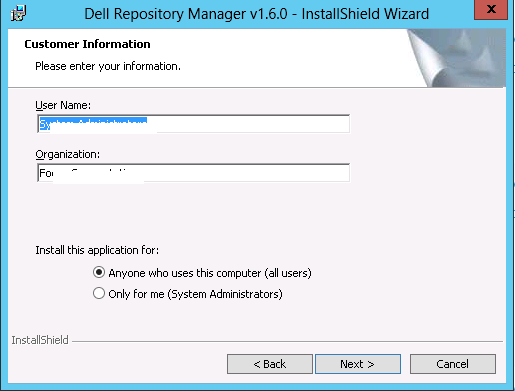 Add an SMTP server name and credentials if required, and click APPLY. Enable the WARRANTY EMAIL NOTIFICATIONS. Set the TO and FROM e-mails as appropriate. Check the box for INCLUDE DEVICES WITH EXPIRED WARRANTIES and change it from 7 to 30 days. Click APPLY. Click on the DISCOVERY AND INVENTORY sub tab. 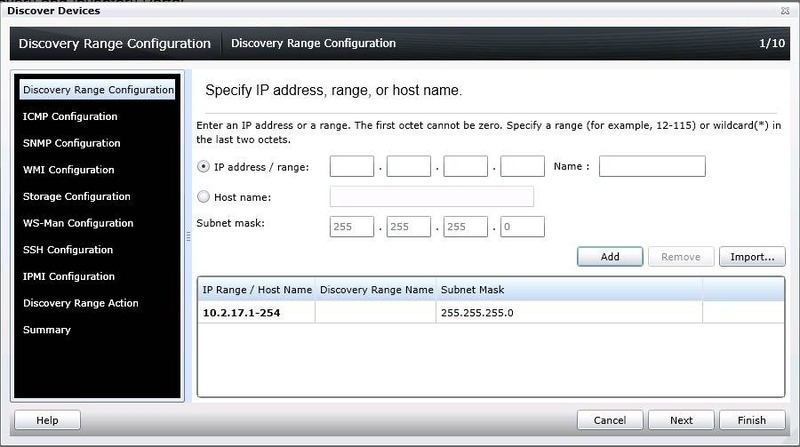 Add an IP range such as “10.0.0.1-254” with a mask of 255.255.255.0 and click ADD. 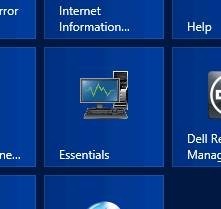 Are all likely Dell servers. For my example, I’ll assume those were searched for. 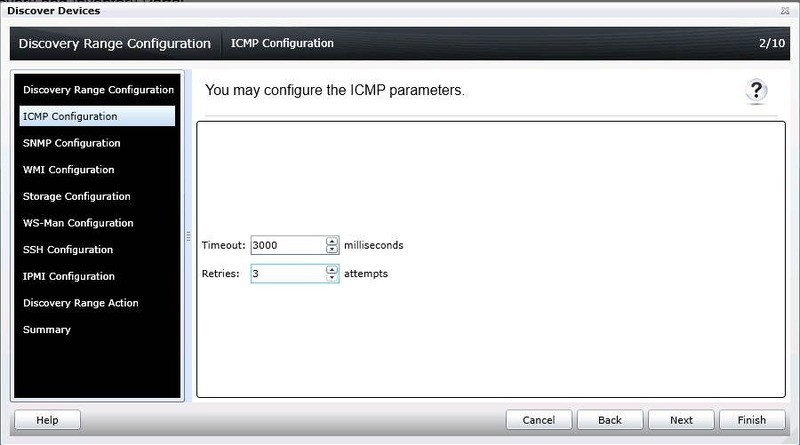 On the ICMP Configuration screen, I recommend changing the defaults from 1000MS and 1 attempt to 3000 and 3. Click NEXT. 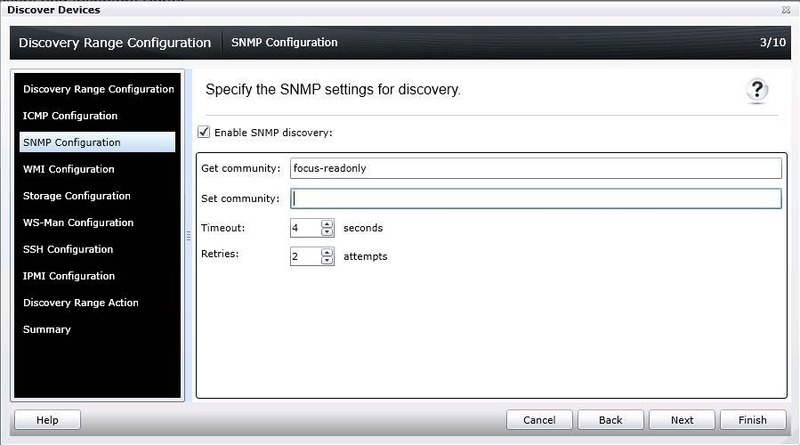 On the SNMP Configuration screen, enter the READ community name and click NEXT. 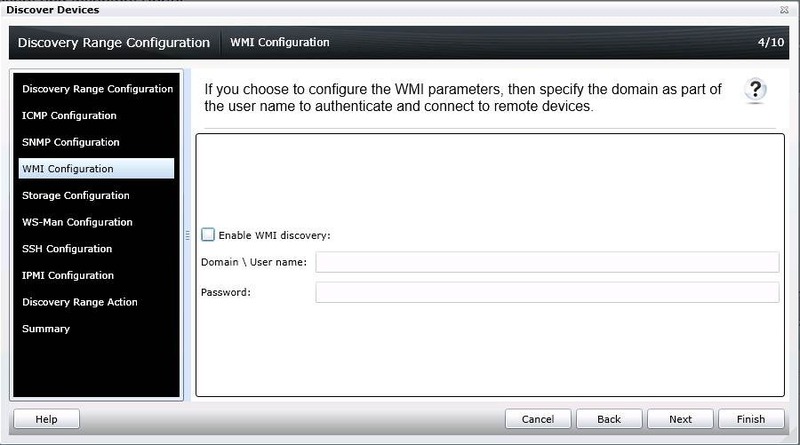 On the WMI Configuration screen, we’re going to omit this for now. Click NEXT. 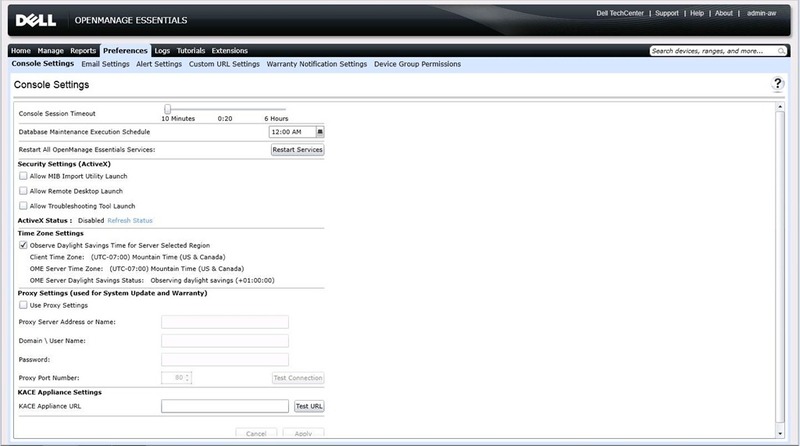 On the Storage Configuration screen, we also omit this as we use no such devices. Click NEXT. 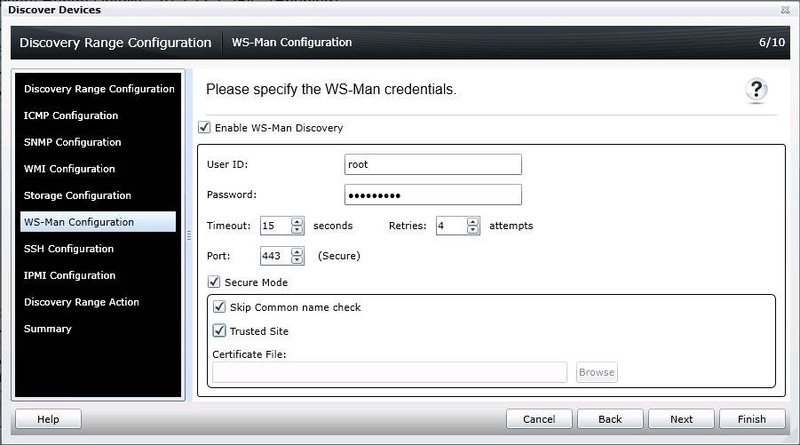 On the WS-Man Configuration screen, we enter the ESXi root user and password and check the boxes. 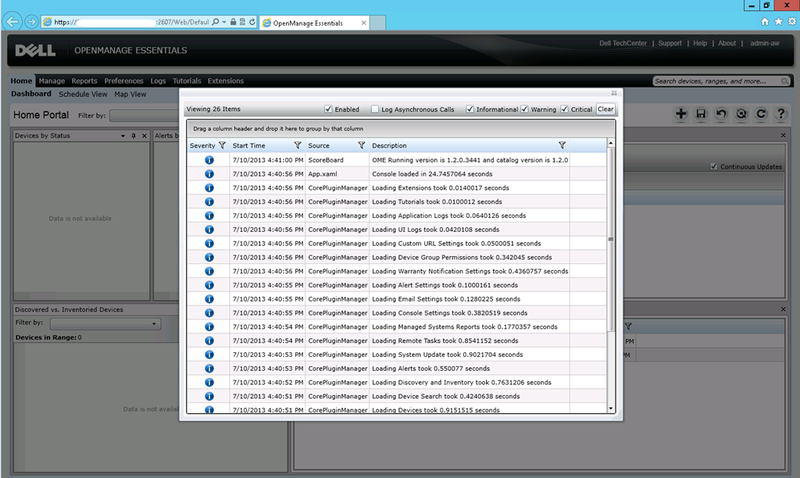 There is some later configuration of ESXi hosts to do yet. Click NEXT. On the SSH Configuration screen, we also omit this as we have no linux servers. Click NEXT. 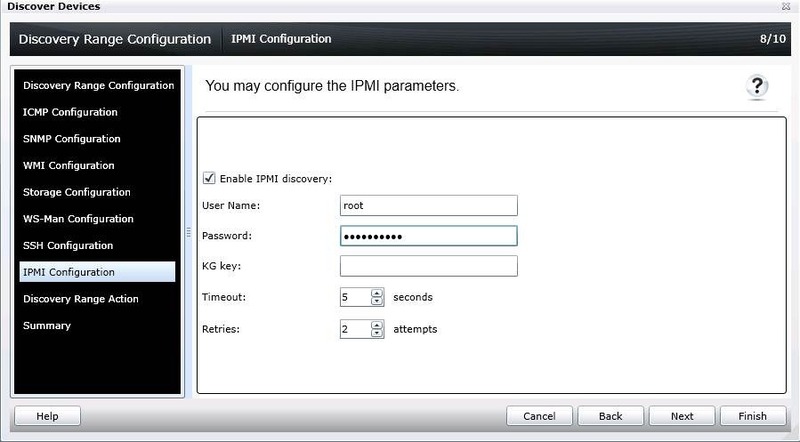 On the IPMI Configuration screen, enter an IPMI (iDRAC) username and password. Click NEXT. On the Discovery Range Action, accept the default of PERFORM BOTH DISCOVERY AND INVENTORY. Click NEXT. This will take some time to run. Once complete, if you click on the range, you’re going to see details on what it found. Here we can see the devices detected. The “Unknown” we’ll largely ignore, this is going to be workstations and other devices and we will eventually purge them out of here. 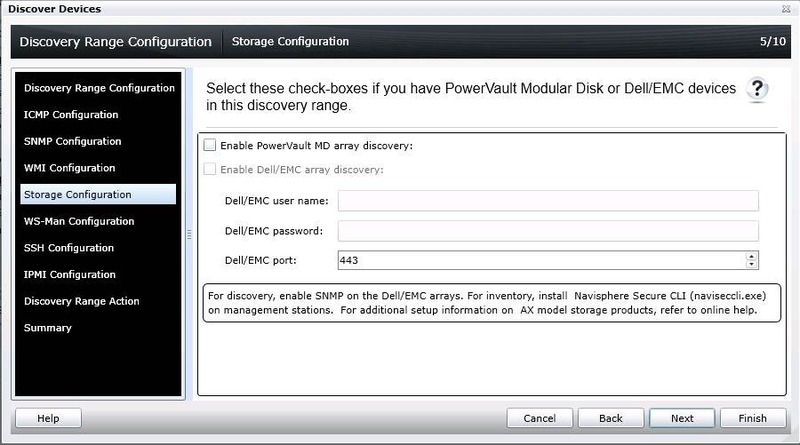 Let’s expand the VMware ESX Servers and then pick one of the hosts as shown, and then expand it. 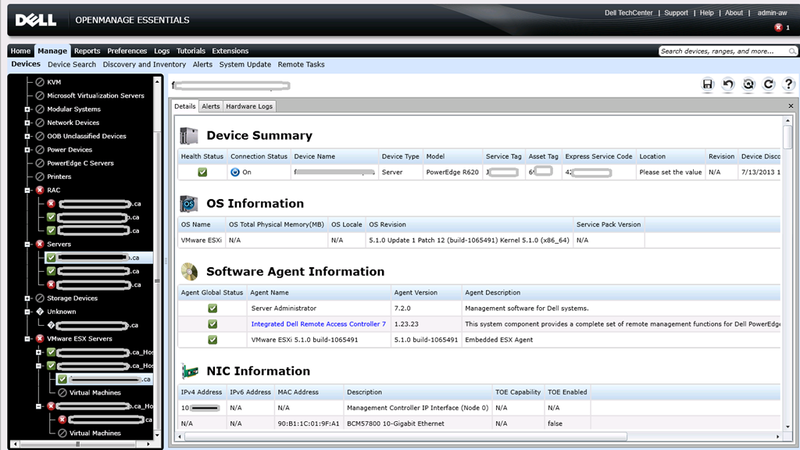 As you can see, we get a summary of the NIC information, the VM’s on the host, etc. 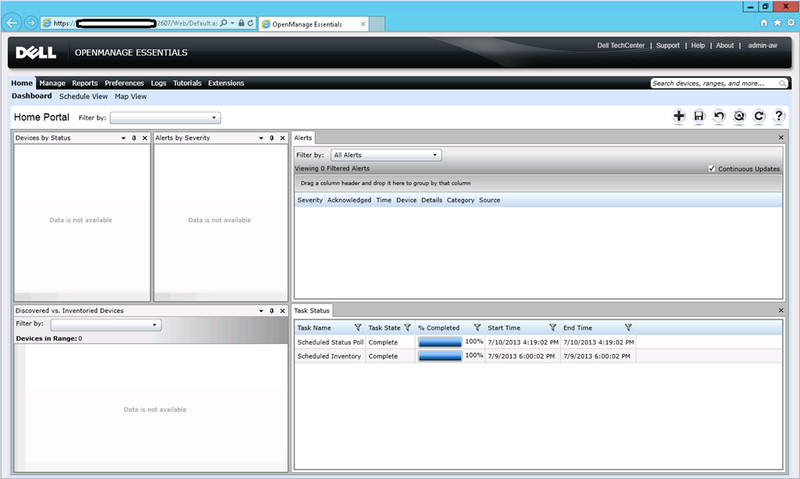 We are not seeing ALL of the information yet, because the ESXi hosts have not been configured for use with OME. We’ll handle that in a bit. If you click on the section with GREEN CHECK BOXES, the RAC, you’ll see each of the iDRAC’s listed. This will give considerable detail about the machine, as well as things like Service Tag, Express Service Code, etc. If for any reason, over time you notice that your hosts seem to change their name all on their own, double check that the “reverse DNS” or PTR record is accurate, does not have duplicates, and is not reused from a previous server. Often we will manually create A records but not the associated PTR’s. Good System Monitoring is only as good as Good System Maintenance is. We can very quickly see why we’re going to want to omit the workstations from our scans, as well as VM servers, etc. This is one reason why often a Discovery and Inventory scan is best done by individual host name rather than scanning the network. At a later date, we’ll configure the alerts section to e-mail on up/down/etc. 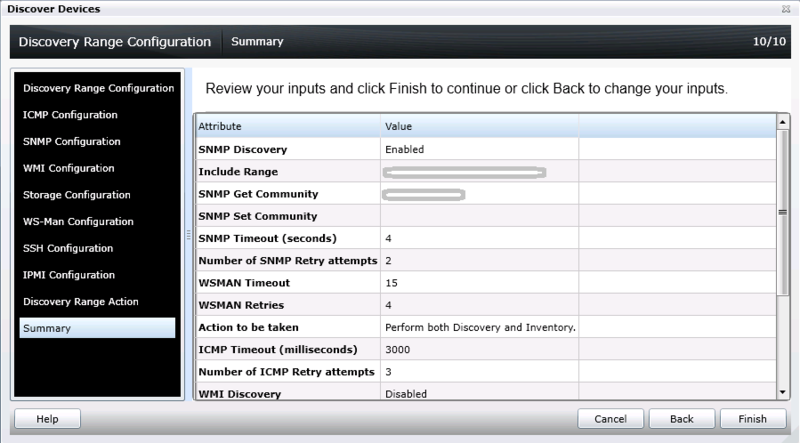 And then select the CONFIGURING ESXi 4.x and 5.0 for DISCOVERY AND INVENTORY. 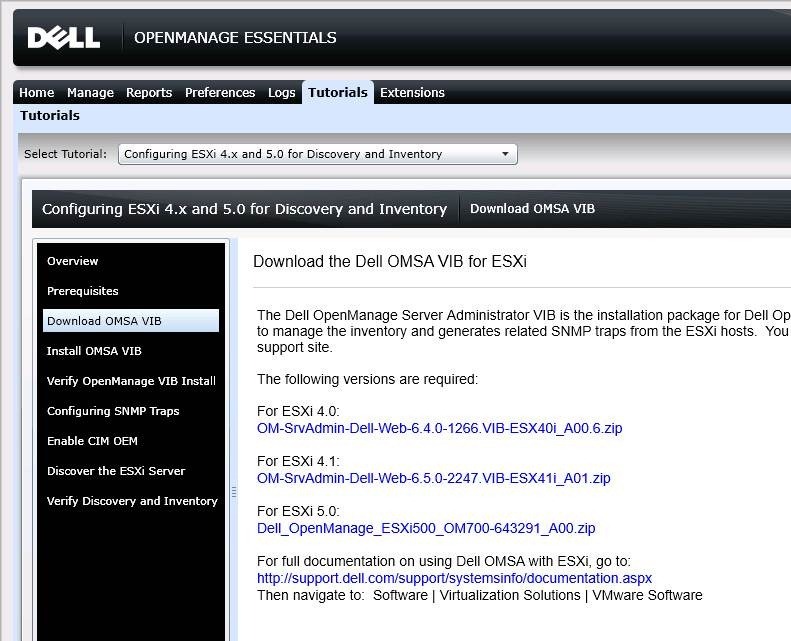 Most of these steps are already done, as we already apply the OMSA VIB to our servers by default. 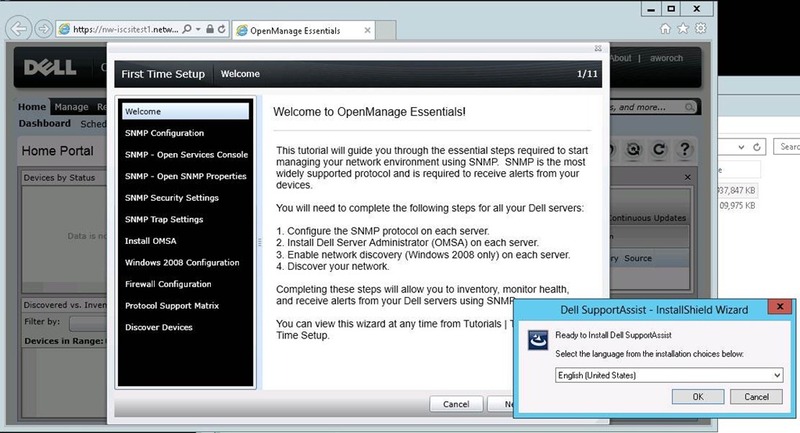 We also have standardized the enabling and setting of SNMP – but NOT the sending of traps to the OME server. 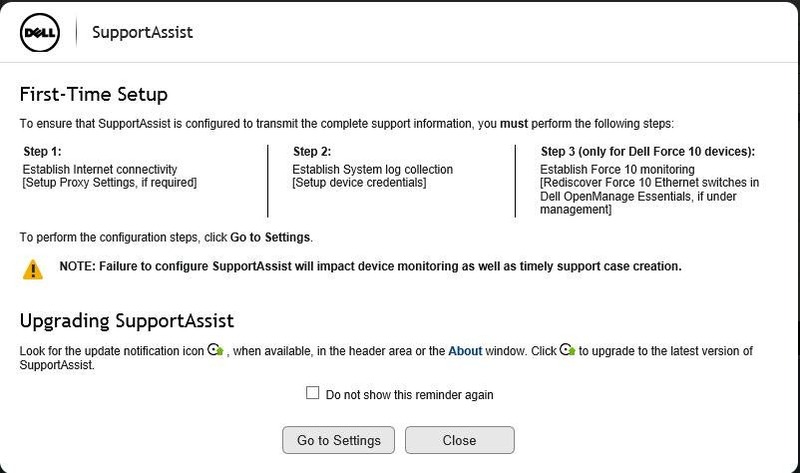 Here we can perform updates to the system, for items such as BIOS, Firmware, Drivers, etc. In the upper left, we can see that a “NEWER CATALOG VERSION IS AVAILABLE”. Click GET THE LATEST. We now have the latest catalog. This largely covers first time setup of the product. It takes a while to get systems inventoried and status’ updated. There will be yet another HOWTO in this series to cover how to effectively use the product, which I will cover once I deal with with the IP Reverse DNS issues identified in Step 10. 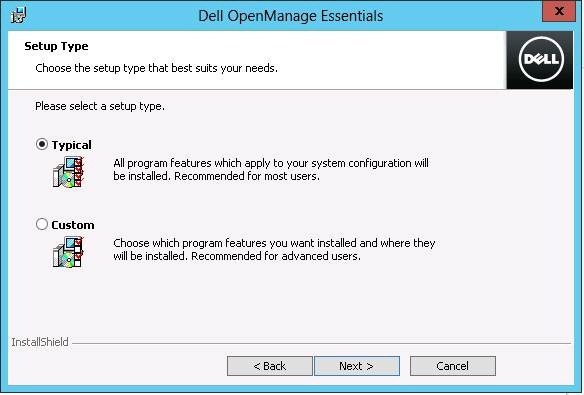 In a previous HOWTO (HOWTO: Installing Dell Open Manage Essentials (OME) v1.2 on Windows 2012) I covered the installation of Dell OME v1.2. 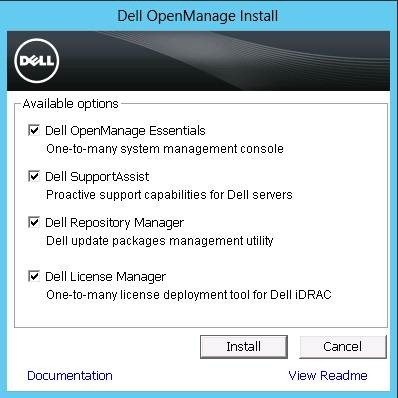 This installs other additional components – one of which is Dell License Manager, used for managing Dell iDRAC Licenses. This document covers the simple installation of that product. 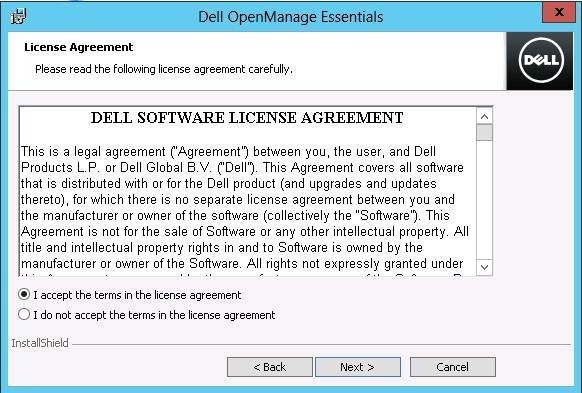 Accept the option for LICENSE MANAGER and click NEXT. 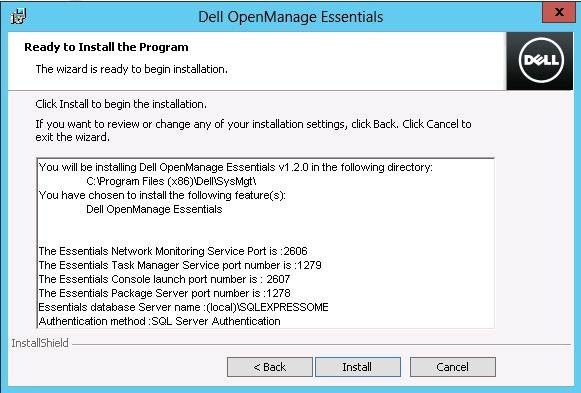 In a previous HOWTO (HOWTO: Installing Dell Open Manage Essentials (OME) v1.2 on Windows 2012) I covered the installation of Dell OME v1.2. 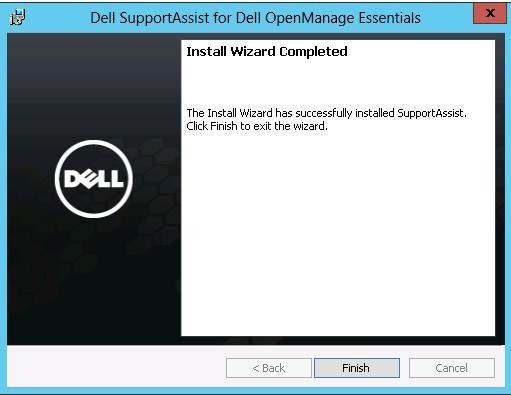 This installs other additional components – one of which is Dell SupportAssist v1.2.0, used for sending support requests as a “phone home” to Dell Support with details about any hardware failures it finds. This document covers the simple installation of that product. 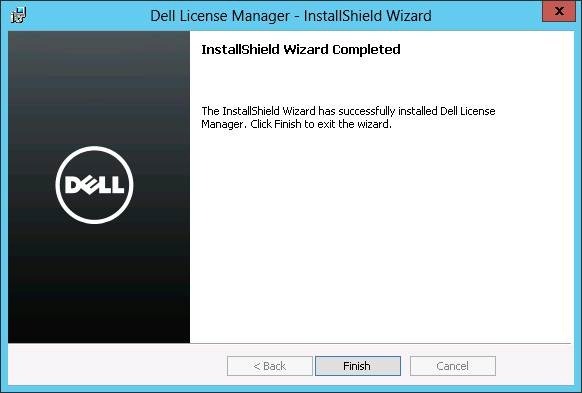 6) On the INSTALL WIZARD COMPLETE screen, click FINISH. 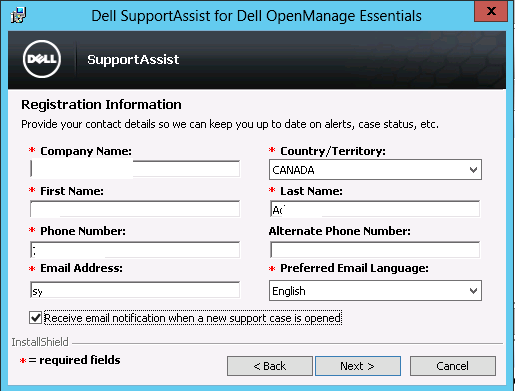 7) When you restart the Dell OME login, the SupportAssist screen will pop up. Click GO TO SETTINGS. PASSWORD = the appropriate password. RECUR EVERY = 1 Week on SUNDAY at 12:00AM. 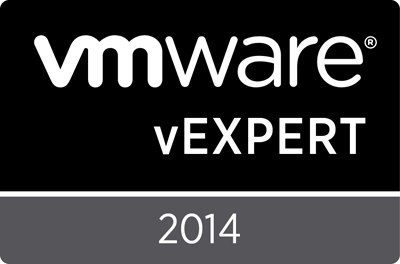 There are a few other device types, so do the same for ESX/ESXi and the IDRAC7 (RMU). 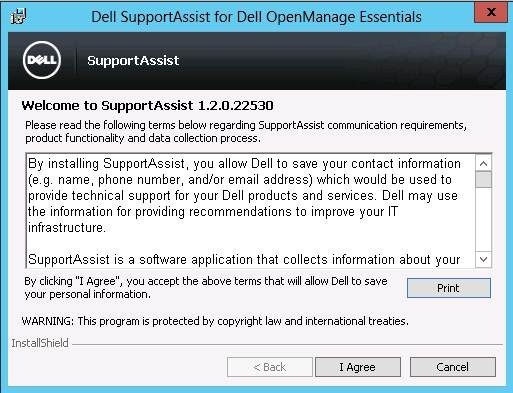 You can now continue or close Dell OME/SupportAssist if you wish. 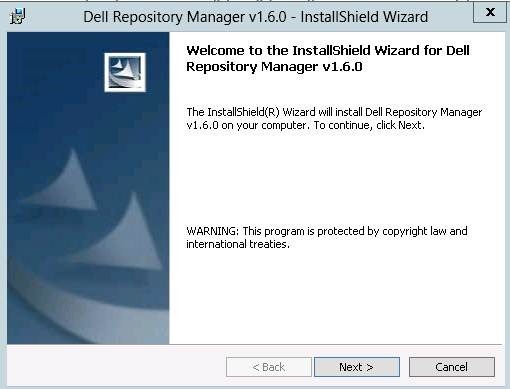 · Creation of Dell System Update Utility (SUU) DVD media for performing offline (non-network) based upgrades and installations at the local system. · Hardware failures and warnings – eg: fan failure, RAID degraded, temperature too high, etc. You may note that this is largely feature comparable to something like IBM Systems Director for IBM hardware. 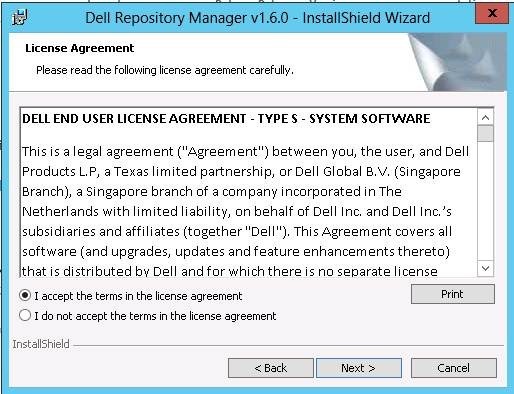 This document will cover only the installation of the software. Later documents will cover the “First Time Setup” and then the “Day to Day Use and Administration”. 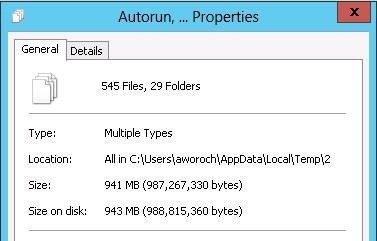 2) The installation EXE is nearly 1GB in size, and is a self-extracting ZIP file. 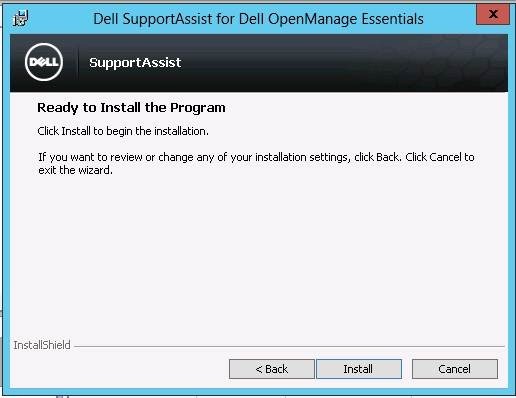 This will prompt to unzip the files and then automatically start the installer. Click UNZIP to being. 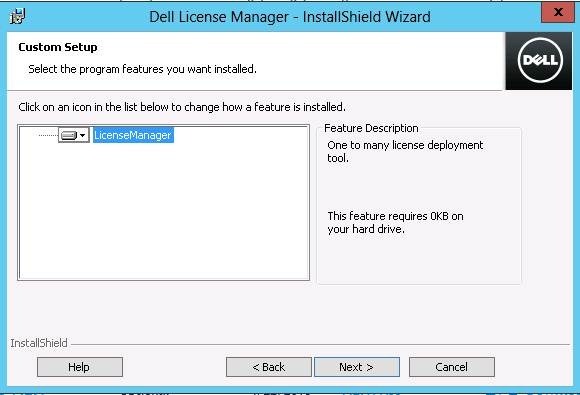 Check all 4 boxes, and click INSTALL. At first glance, this looks pretty intimidating. 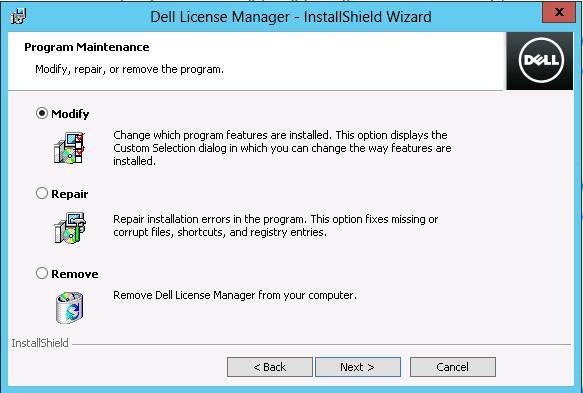 However, unlike some installation programs, where a dependency is not met, there is a link directly on the dependency to fix and install the correction. Most are silent installations. Go through them in order until each is met. Each of the next steps will cover each dependency in a single step to consolidate. 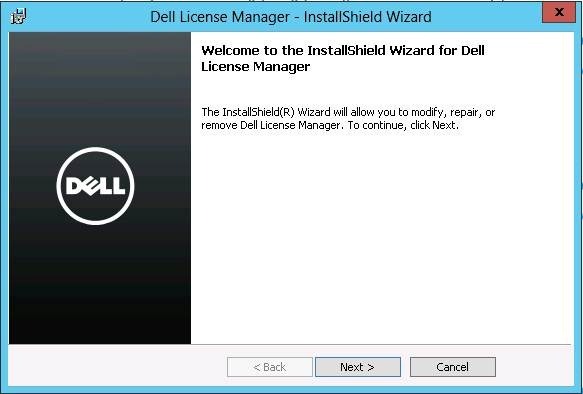 The installer will run a silent installation. 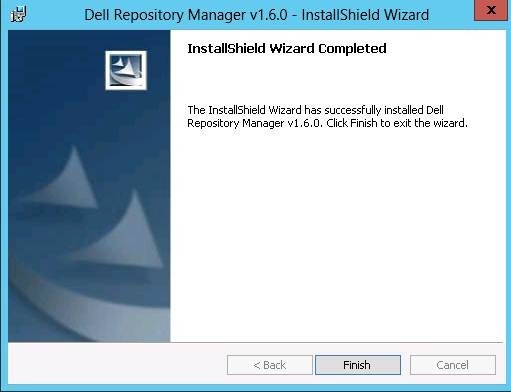 When complete, the Prerequisites screen returns, and IIS7 dependency is no longer listed. 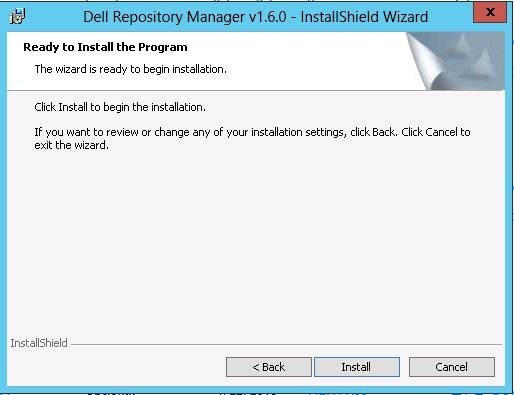 This is more than sufficient of an SQL installation for the purposes of this software. 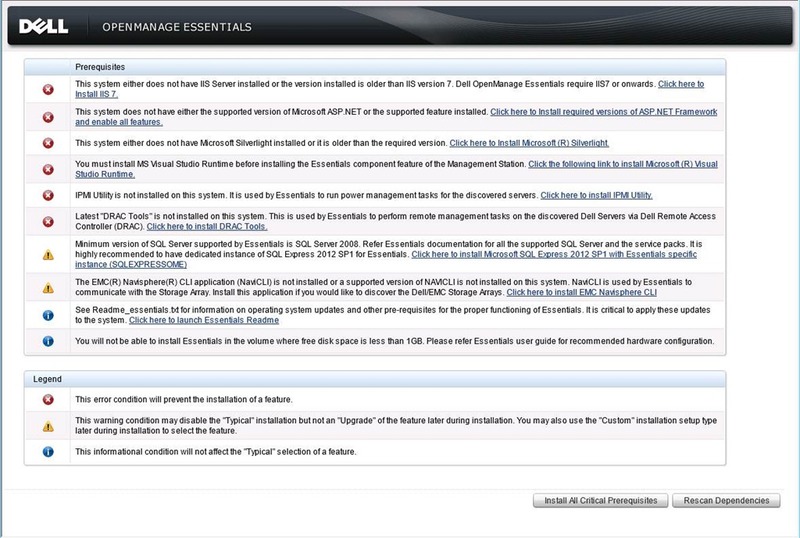 We do not use EMC Navisphere, so we don’t need to install that “cautionary” dependency. The other two are Informational. You’ll also notice that the button in the lower right is now showing “Install Essentials” vs “Install All Dependencies” (which we could have used to speed the process). 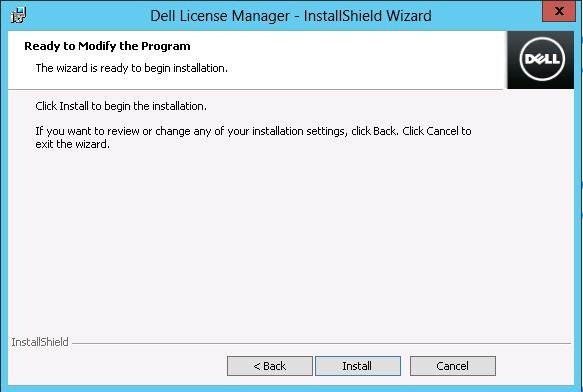 Click INSTALL ESSENTIALS. 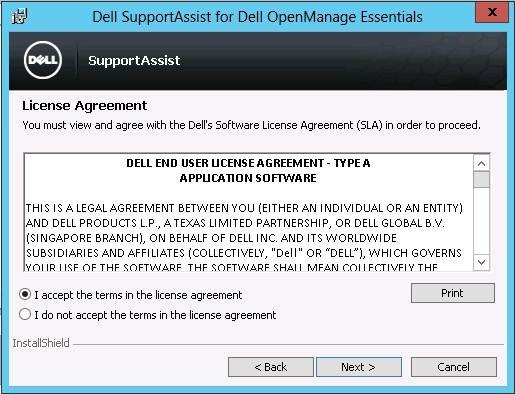 Accept the licence agreement and click NEXT. Choose a TYPICAL Setup Type, and click NEXT. 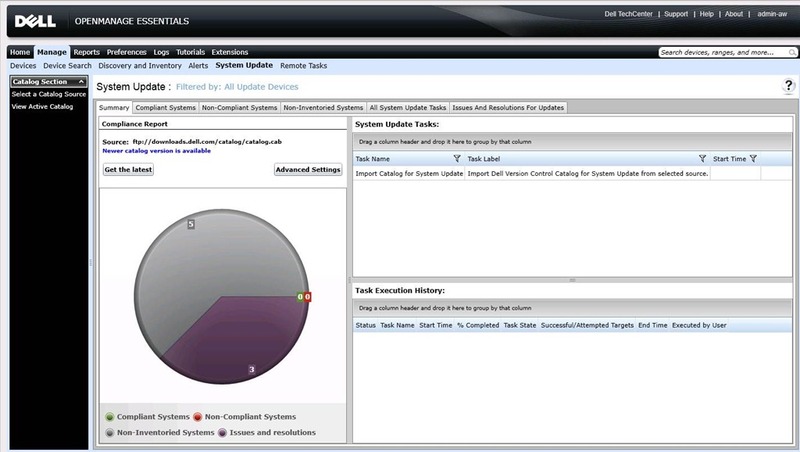 The READY TO INSTALL screen will show a summary of ports and steps. Click INSTALL. When complete, click FINISH. Note that it will launch Dell OME. As you can see, I’m making an attempt to modularize the HOWTO’s to prevent them from being 100+ pages long and to allow administrators to only need the subset that applies to what they’re actually working with. No one wants this kind of stuff littering the C: drive.